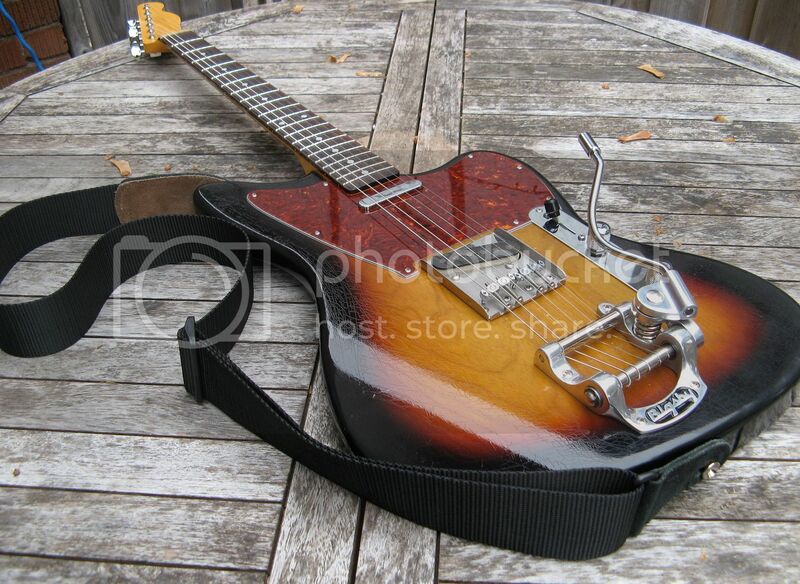 Sold Telemaster with Mastery, Bigsby. Discussion in 'Guitar Emporium Archive' started by zztomato, Apr 22, 2016. Here's a guitar that I thought I would keep but I have my eye on something. Assembled by me in my shop. Musikraft V-C neck. fairly chunky in feel but very comfortable. Maple / Dark Rosewood - 1-11/16 Nut - 2-3/16 Heel - 9.5 Radius - 6105 Fret - SA Truss @ Heel - 11/32 Vintage Kluson - Soft V to C (.87 X .95) Profile - Oil on Fingerboard. I finished it to be kind of very mild relic. Bone nut. Don Mare pickups- Stelly neck and Hayride bridge. Great range of tones. The Stelly is one of the best strat type neck pickup tones around. This is a REALLY solid guitar. Stays in tune beautifully. Bigsby works amazingly well with the Mastery bridge. That looks so sweet, wish I had the scratch, yadda, yadda, & GLWTS. Thanks for the nice comments. She's pretty sweet. Is the body string through? Where did you get that tortoise pg? The body is string through, yes. You could convert it if you didn't want the bigsby. Trust me though, The Bigsby is awesome on this guitar and, to me, makes the whole look. Guard came from pickguardian. Thanks. I have a Telemaster in the builds too. Was just being curious.